Description: These costumes are incredibly special to me. They are the costumes that my husband and I got engaged in! These are the actual pictures from our engagement and I was so surprised and just over the moon! I had made both costumes in the weeks prior to the event, and both of them were quite the commitment. The tailcoat was the most challenging. I used a base jacket pattern and altered it almost beyond recognition. the whole coat is lined and trimmed in gold braid. It is made out of a blue suede and is lined in a dark gold satin. The undershirt was bought and had the ruffles added to the sleeves, and the pants were bought and I added the gold trim down the sides. The vest was made from scratch, using an existing vest as a pattern, and is interfaced, lined and has functional buttons. The ascot was patterned and made from scratch and the gem in the center of the ascot was resin cast and set in a worbla setting. The fabric for my gown was gifted to me by my best friend. She showed up at my house one day with three trash bags full of fabric, and shoved them at me, Demanding: "you have to make the thing..." I looked in the bags, and there were six sets of gorgeous gold curtains, and I just knew it was meant to be. I have been wanting to make this gown since before I learned to sew, and everything just came together so perfectly for these costumes. The bodice for the gown was an altered simplicity pattern, but the sleeves and skirt were patterned from scratch. The bodice is a fully lined and boned corset with lacing up the back and a modesty panel. The hoop skirt was bought, but the petticoat under the gown was made from scratch using an altered simplicity pattern as well. I made some executive decisions to change some small details on the gown, such as leaving out the traditional swags and doing a pleated hem at the bottom. I also added some piping and lace detailing to the bodice and embellished the sleeves with some gold roses. In addition to all of the fabric work that went into this costume, I also did quite a bit of work on the hair. I used my real hair as a base, and sewed together pre made wefts into tracks and sewed wig clips in them to make clip in extensions. I also bought a pre made bun, and added the gold trim as well as several tracks of wefts to the bottom to hide any of my natural hair. I went for a more "half up, half down" style rather than a full updo because it flatters my face a bit more than the traditional style. 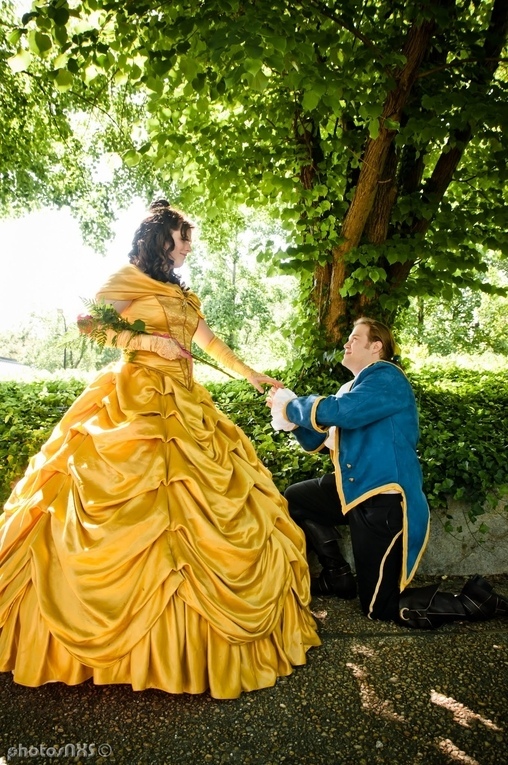 As for the actual proposal, all of my closest friends had also gotten all dressed up as princes and princesses and we were going to do a photoshoot at the con (Animazement 2013) on Saturday, and it was the most wonderful surprise! He led me down a stone staircase into a courtyard where all of our friends and family were waiting, and we went to the center of our group of friends that were all lined up in their Disney costumes, and music began to play. He had gotten his father, cousin, and two of his closest friends to play the song that we first danced to... and then he sang the entire song and danced with me. The entire time I was seeing people in the crowd from both of our families, and when I saw my grandmother there, I realized exactly what was happening, and began to tear up. He then got down on one knee and asked me to marry him, but instead of a ring, as per modern tradition, he proposed with his great grandmother's thimble. Before rings were common for proposals, people would exchange thimbles as a token of their love and devotion, and it seemed most appropriate in this particular instance. We were married March 30th 2014 at a small castle in North Carolina and are now living Happily Ever After! Get your fabric from thrift stores! I use old sheets for muslin, and at $1 a piece its so much cheaper than buying your muslin at the fabric store. I also scour the bedding and curtain sections for beautiful fabrics that I can use for costumes. My Belle gown was made using six sets of gold curtains that a friend bought for me for less than $20!!! Invest in good undergarments! I use a hoop skirt for almost half of my costumes, so I made sure to invest in a relatively nice one so that I don't have to replace it as often. Having costumes that use the same undergarments helps reduce the amount I have to spend on each one! Choose your shoes before hemming your gown! designating a pair of shoes for each costume will save you the hassle of your skirts being too long or too short. If your shoes are always the same, your hem will always be perfect! Choose costumes you can wear multiple times! All of my Disney princess costumes can be used for charity work, costume parties, or Halloween each year in addition to the conventions I attend. They are very recognizable and fun for everyone, no matter the setting!